There was a time I was absolutely apprehensive about using yeast. I had this preconceived idea that only professional bakers had the magical ability to decipher when the first rising was complete. And what about the business of punching down the dough…what if I punched it too much, would I deactivate the yeast? What if I did not punch it enough? It just seemed very complicated. I decided to confront my fears and misconceptions about yeast and have never looked back since. So, if you think that yeast is too complicated and that you cannot even beat an egg, never mind about punching down dough…I am here to assure you that if I can work with yeast, anyone can. I bet you if you just tried it once…you will get hooked. Just like me! And this is the perfect recipe to begin with. I got very excited when I first saw the ingredients for this recipe. You see, I’ve already had the pleasure of making a yeast dough with the addition of mashed potatoes and the results were amazing (just click on the recipe link for the softest cinnamon rolls ever… Easy Mashed Potato Cinnamon Rolls). 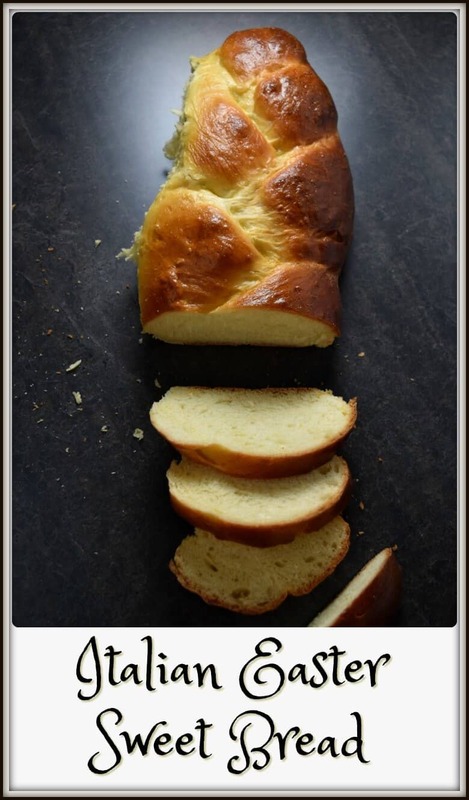 This recipe for Lina’s Italian Easter Sweet Bread can make 6 round or 3 braided loaves. You can decide whatever shape you want. This Pane di Pasqua recipe is a really wonderfully soft dough to work with. It’s super easy to make the braid and the final product makes anybody look like a pro. Here you have the round version of the same recipe. I am sure you can also make individual mini breads with this dough…something to add to my to-do list! It’s no secret that I absolutely love anything made with yeast. When a colleague of mine, Fabiana, learned of my yeast obsession, she was generous enough to share her family’s recipe for this Italian Easter bread with me. My friend’s mom was born in Ururi, a small town in the province of Campobasso, in the Italian region of Molise. I learned that there was a migration of Albanian refugees following the invasion of the Balkans in the 15th century by the Ottoman’s empire. Ururi was one of the places that these uprooted Albanians settled in. I can’t help but wonder if this recipe, which according to Fabiana, was always referred to as poprati, was influenced by the Arbëreshë people. The original recipe said, with regards to flour, to use quanto basta – which essentially means to use as much flour as the mixture will absorb. If you think that a description like that in a recipe is super vague and unhelpful, you are not alone. These two words have haunted so many of us trying to recapture and honor our families’ recipes. But we are a resilient group as we continue to bake and document as best as we can. I would like to mention that the original recipe that Fabiana provided me with had 1 1/2 cups of sugar. I reduced it to 1 cup. That’s the beauty of recipes, you can adapt to your own preferences. 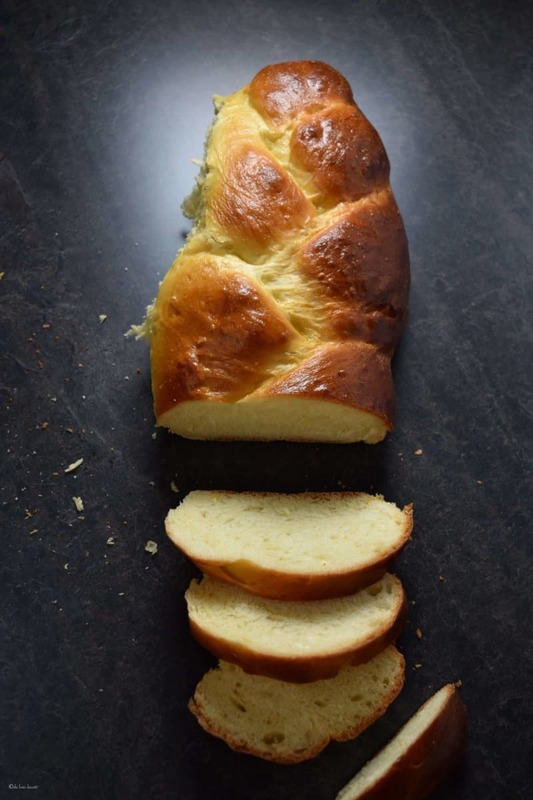 Lina’s Italian Easter Sweet Bread…also referred to as Pane di Pasqua… I absolutely love it! Thank-you, Fabiana, for sharing your mom’s poprati. Looking for more authentic Italian Easter recipes, just search in the recipe index or consult this Easter category of recipes. This Italian Easter Sweet Bread aka Pane di Pasqua is a simple, light yeast bread flavored with a hint of orange. Truly an authentic egg bread recipe! Dissolve yeast in warm milk. Add 1 tablespoon of sugar and stir. Set aside for 10 minutes. Meanwhile, in a large mixing bowl (of stand mixer) whisk eggs at medium speed until nice and frothy (3-4 minutes). Gradually add sugar. Continue to whisk for another 3-4 minutes. Whisk in the oil and orange zest. Combine yeast mixture with riced potatoes. Add to egg mixture and whisk together on low speed. Add half of flour mixture and mix on low speed for about one minute. Mix for about 5-8 minutes until smooth and elastic. Alternately, you can knead by hand. Place the dough in a lightly greased bowl. Make sure to turn dough in order to completely coat the dough with the oil. Let rise for about 1 hour or until doubled in size. Divide in 6 portions if making round loaves or in 3 portions if making braided bread. (Continue to divide each section in 3). For braided bread: roll each section into a log (about 10 inches long and 1 1/2 inch thick); start making a braid with the three strands. Tuck ends underneath the braid. Cover with clean tea towel and let rise for about 30-45 minutes or until double in size. Brush loaves with egg wash (whisk egg and milk together). Bake small round loaves for about 25-30 minutes; bake braided loaves for about 50-60 minutes. Depending on your oven, you might want to place a sheet of aluminum paper loosely over the loaves, to prevent them from over browning. The serving size is calculated as 1 loaf. 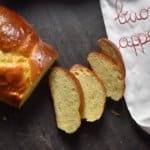 DO YOU LOVE THIS ITALIAN EASTER BREAD RECIPE? Hi Maria, I have lost my own recipe so on a whim I googled it & here’s the recipe I have used before. Thank you very much. I have made it before for my grandchildren & children, they liked it especially when I made French toast with it. In my region, Puglia, we add almonds stuck in the creases of the braid so they roast& the aroma stays in the house for a while. How wonderful! I love the idea of the almonds. Thanks for taking the time to share. Thank you, not only for this wonderful pane di pasqua Maria, but for the detailed info about the origins of the recipe. My parents are both from Ururi and this recipe is just as my mom makes it! A truly delicious treat we enjoy together every Easter. This year, for the first time, I will venture to make it on my own for my family and continue the tradition! Buona Pasqua e di nuovo grazie! Thanks so much for your kind words Lore. How wonderful you are keeping this Easter tradition alive! A wonderful way to help the younger generations connect to their heritage, and equally important, keeping the memories of loved ones that have passed alive. Auguri di Buona Pasqua to you and your loved ones. Happy Easter! Finally a real recipe. The more you mix it the better. I make the Bulgarian version (kozunak) for years, but this is different in a good way. Thanks! Thanks so much Vihren. Appreciate you taking the time to comment. Happy Easter to you and your loved ones. Omg! So happy I finally found this recipe. My aunties would make it with potatoes, but they’re no longer here unfortunately. However, I remember they would add a few tsps of anise liquor..would it be ok if I were to add some anise extract? Can’ Wait to try it…would it be allrighg to bake it a few days before Easter and how should I store it? How wonderful Rita! My pleasure. Yes, the anise extract is a great addition… especially if that is how your family would make this pane di pasqua. As you probably know, this bread is best the day that it is baked. I will usually freeze mine and then thaw overnight in the refrigerator the night before I am planning to serve it. Bring to room temperature before serving it. Leftovers make some great “Italian”french toast! Oops. Sorry, I misread the ingredients list. Confused. You say sugar was reduced to one cup, yet recipe calls for one tablespoon. Hi Diane, the 1 tablespoon is for the yeast… if you look at the next few ingredients, you will find 1 cup of sugar. Hope that helps. Thanks for stopping by. Although I have never tried it, I think it should work just fine. If you do decide to try it, I would love to hear how it turned out for you. Happy baking! My pleasure Michelina! It never seizes to amaze me how the aroma and smells of foods baking and cooking can bring us right back to our youth. Thank you so much for taking the time to comment, appreciate it. I have never made Challah bread nor too many loaves of bread by hand! But I made this in our Motor home, small oven, cramped space for Easter and it turned out absolutely WONDERFUL! If I could make this anyone could. Well my husband helped me a lot too!!! I’m glad you enjoyed the bread. I really appreciate your comment! Thanks!!! I do not put any salt. Enjoy the bread! I am making this now – it already smells divine! The magical powers of yeast! Enjoy!!! Thanks for the comment. These wonderful breads have just come out of the oven and I can’t begin to describe how gorgeous they are! I cut into one of them while still warm (I simply couldn’t resist) and devoured a slice….absolutely delicious!! Brings back fond memories of my childhood and Italian roots. This recipe deserves 6 stars! Thanks so much! I am so very happy they were a success! I will thank Fabiana on your behalf. Appreciate the comment. Buona Pasqua!